April 26, 1937 — Identified by the now-anonymous photographer as the Ridge Route, but more correctly US-99. This 3-lane section of highway was completed in 1936 and replaced the Ridge Route's tortuous Grapevine Grade. The location is near present-day Lake Pyramid; the dam and reservoir were completed in 1974. Unattributed 3¼x5½-inch glossy print from a flea market. 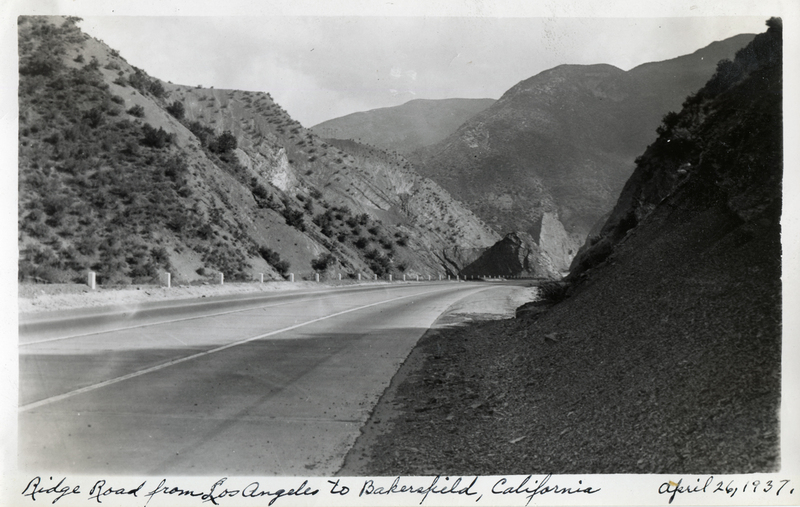 Anonymous handwritten caption reads: "Ridge Road from Los Angeles to Bakersfield, California | April 26, 1937." An inscription on the back, in pencil and in different handwriting, says the same thing. Di3701: 19200 dpi jpeg from original print.